Snow! Why is there snow in your pictures Melissa? Let me tell you why. As most of you know I attended the Kylee Ann Sleepover in January of this year! As a part of this event there were MANY photo opportunities available for us. There were so many I have had to spread them out so to not overwhelm you all. 🙂 So that is why in May I am sharing photos of Knee Deep snow at Denzil Stewart Nature Park. 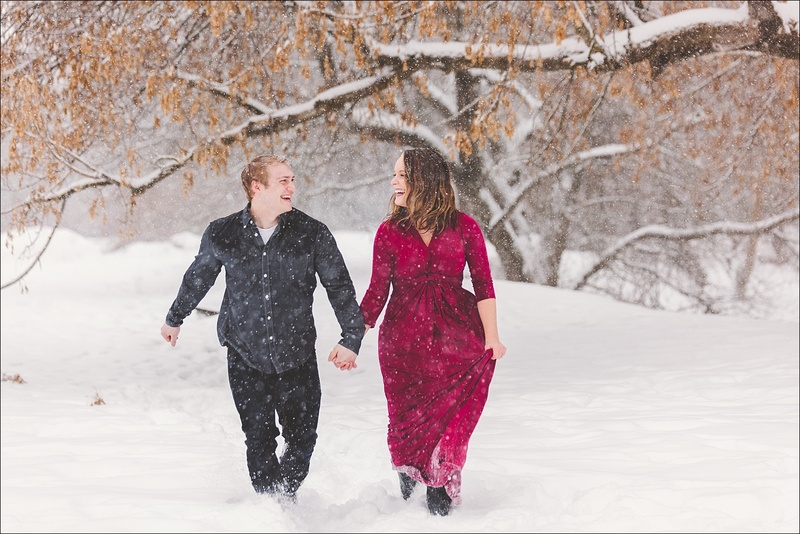 This Beautiful couple were not upset by the snow! By the time I was able to photograph them they had been in the downfall for nearly 20 minutes. But they didn’t utter one complaint. In fact they were are smiles and Giggles till the very end. I had asked Grant to run up behind Katelin and he had free range to do whatever silly thing he could come up with! Katelin was laughing the whole time anxiously waiting to see what her husband was going to do. 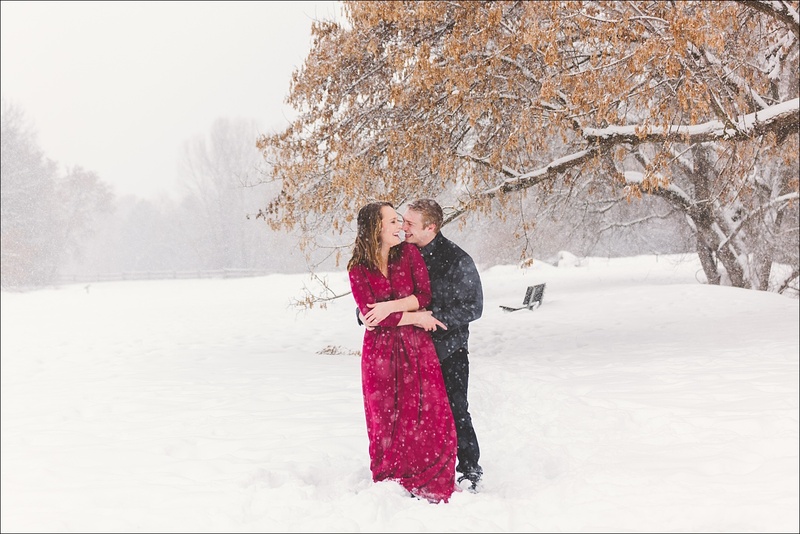 Would he throw a snow ball at her… would he pick her up and throw her in the snow… NO, he grabbed her in a bear hug from behind and gave her the cutest snow snuggles Ever! Every time I look at these photos I am in pure heaven. 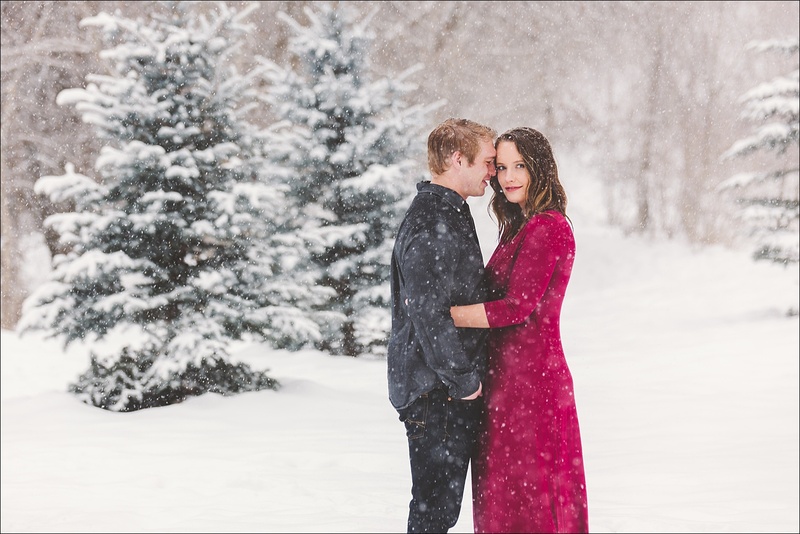 The look in these photos with the falling snow is incredibly Dreamy… I get so giddy! A huge thank to Kylee Ann for the beautiful Shoot setup… and to Lettie Boutique for donating this beautiful dress! MelB Photography is Determined to Capture your Life Events in a Unique and Beautiful way! High School Seniors are my Jam! That being said I find few things more enjoyable that taking pictures! If my camera is in my hand a smile is on my face! High school seniors, Weddings, Couples, Families, and Head-shots! Details and beautifully edited photos are what I am know for! I will take the time that it requires to edit your photos to look their absolute best! So let Plan… then let’s PLAY!